Always on the rapid move, they are hard to get the focus right on. Although I haven’t finished the previous post just yet, I thought I would go ahead and begin posting some bird images. 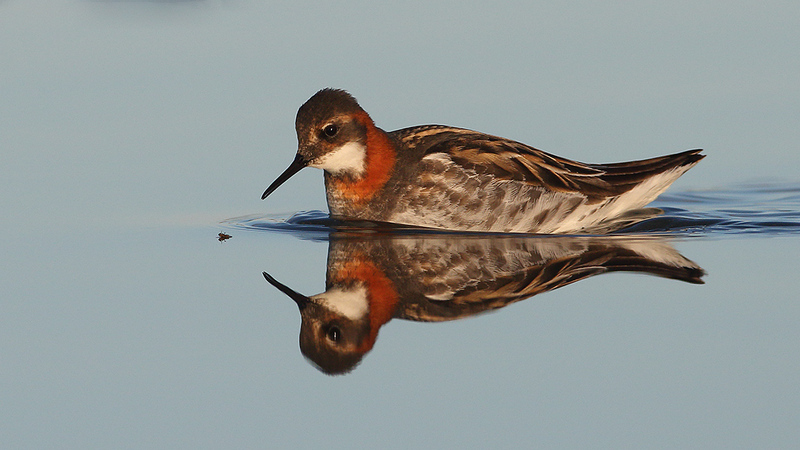 The red-necked phalarope phalaropus lobatus is something of a character bird in Arctic regions. In Chukotka it is a common breeder as well as spring and autumn migrant, and a true photographers dream it is, with its stunning colours and trusty demeanour. I had only just landed in Ugolnye Kopi when I found the first many, and they were cooperative to say the least. Phalaropes are small waders which distinguish themselves by having semi-palmated feet, meaning they are efficient swimmers. They like to twirl in the water like whirling dervishes, stirring up small crustaceans and other small prey in the process, and picking it all off the water with extremely rapid movements, most of which the human eye will miss, but the camera will catch. At the beginning of our stay, just about every meltwater pond around town had numerous phalaropes feeding and mating. When we returned from the big caterpillar expedition, the great majority had moved on further North, with only the breeding population staying behind. Here’s a selection of images, in no particular order. Remember to click on the first one to see it in full resolution, then browse the gallery. I hope you like them! Meget smuk serie .. og rigtig godt hvor de stå op.. Det så vi ikke på Island.